This is the ultimate ladies' fantasy book. Imagine a travelling to a beautiful country to be waited upon while you relax in the sun in complete peace and quiet. There's a whole industry based on this fantasy: spas. The ladies in The Enchanted April don't have a spa to run off to. They aren't the kind of ladies to get massages or mud facials. Mrs Wilkins is bullied by her husband who thinks he married a weirdo. She tries to please him but it's not working. Mrs Arbuthnot believes her lot in life is to serve the poor. Her favorite saying is, "Think of the poor." The women meet when Mrs Wilkins sees Mrs Arbuthnot reading an advertisement in the paper for a holiday to a castle in Italy. Although they don't know each other, they can see the possibilities. April in Italy, away from the gray, dreariness of their lives. The cost is more than they are willing to pay by themselves so they advertise for room mates. Two apply: Lady Caroline Dester and Mrs Fisher. Both have their own personal reasons to want to escape for awhile. At first, the four women clash but eventually San Salvatore does its magic. I loved The Enchanted April by Elizabeth Von Arnim. This isn't some sad sack story, although I was shocked at how these women believed their own happiness is unimportant. Still, it made me laugh out loud in places. Mrs Wilkins (Lotty) is a bit of a nutter. She's the first to fall under San Salvatore's spell. She embraces her quirkiness and gains a confidence she never had before. She's convinced the icy standoffishness of the others will melt with time. Mrs Arbuthnot (Rose) is frightened but also a little jealous of Lotty's epiphany. She wishes she had back the love of her husband she once had. Lady Caroline just wants to be alone and think about her future. Mrs Fisher wants to be alone to think of her past. Of course, they all come around and make friends which ends up solving their problems. I had an issue with Lady Caroline. She's so beautiful that any man in her presence turns into a drooling idiot. They "fall in love" with her instantly without her saying a word. This annoys her to no end. Everyone just smiles and expects her to put up with it. I wanted her to kick the guys in the nards. She's beautiful so it's okay to stalk her and act like morons? Please. Despite the Caroline situation, I was satisfied with the ending. It is such a peaceful story. I whipped through it in a day. It made me dream of spring. It's not a castle in Italy but a little Enchanted April in January does the trick. 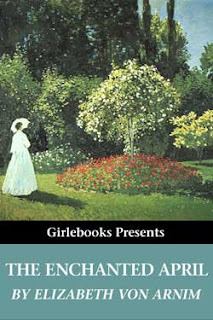 The Enchanted April is a free download from Girlebooks. There were a few typos here and there but nothing too distracting. It's also a New York Review Books Classic. Those books are lovely. Sounds good! I think I am going to download this one. Good! Hope it chases the winter blues away. This does sound good. I think that women have only recently come to expect happiness. Very good! I've heard of it plenty of times but actually had no idea what it was about. !!! Shame on me. I have to find the movie now. I really enjoy this book as well. I think I'll reread it this spring! !